The Archetype or Deity Yantras are symbolic representations of the Deity. The inscribed copper plate holds and then transmits the energy pattern or vibrations of the Divine Being. It is empowered by invoking the Deity's energy and then worshipped according to the ancient scriptures so that the Archetypal (Deity) Yantra becomes your Divine Energy Machine or your personal God connect. Why Dhanvantri Yantra? Lord Dhanvantri is the Vedic Physician; he cures health ailments and protects the wellbeing of his children in this Universe. He encircles you with his positive vibrations which can unchain you from any kind of health disorders.Dhanvantri Yantra is a one stop solution to cure your health problems and to stay in the pink of your health! Dakshinamurthy Yantra - Achieving better future! Why Dakshinamurthy Yantra? Dakshinamurthy Yantra will be very useful to students and professionals, who are longing to pass the exams were approaching and testing. Increase your positive energy and confidence to score the best results. Lord Dakshinamurthy will power with power lines, but gives you all the qualities that will take you to the zenith of success. Sarabeshwara Yantra - A Positive Touch to all Sides of your Life! Why Sarabeshwara Yantra? Lord Sarabeshwara is an incarnation of Lord Shiva; he will save you from negative forces that hold you back from victory. 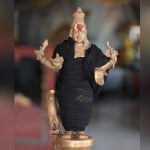 Misfortunes and evil spirits will no longer be at your side when you are under the watchful vigilance of Sarabeshwara. Sarabeshwara Yantra will nullify the negative vibrations that spin around you and rejuvenate you with positive energy. Dattatriya Yantra - The Power Eye to Ward Off the Evil Eye! Why Dattatriya Yantra? When you walk ahead in life with aspirations and dreams, impediments stand as roadblocks to your success. Evil eye casting and other negative forces could nullify your efforts, yet you can move ahead with ease if you possess the Dattatriya Yantra. The Yantra attracts the power of Lord Dattatriya who is the incarnation of the divine trinities—Brahma, Shiva and Vishnu. Knowledge is your power; you strive hard to enhance your knowledge through your academic pursuits and vocational education. Goddess Saraswati is the chief of Education and Knowledge; she is also worshipped in the names of Shyamala, Sharadha, Bharathi and so on. Her power when coupled with your hard work will bring about success in your examinations and tests.